Why Won’t They Let Serena Williams Be Great? Serena Williams, in the very first grand slam match she competed in after giving birth, wore a black bodysuit. She described it as a “Wakanda-inspired catsuit.” Those with intelligence understand that clothing has a minimal impact, if any, on the outcome of a sporting event. Most especially when it comes to a sport like tennis, that of which Williams has dominated for years. However, the quest to outwit physics and make the body as aerodynamic as possible is very real and apparent in sports like swimming, skiing, running, and the like. Those athletes’ attire have not been called into question; they are praised for jumping on the bandwagon of innovation. Somehow, the rules are different for Serena. What in the “French Open” is that about? That is an easy question to answer. It’s called the policing of black bodies which has taken place and continues to take place, even today. Serena, arguably the greatest athlete of all time, still has to deal with the reality that black bodies do not get the same freedoms because they will never be free of inherent racism. While yes, Serena has always had a keen eye for fashion, most recently launching her very own line of clothing, this bodysuit served a very different purpose. It served a medical purpose. 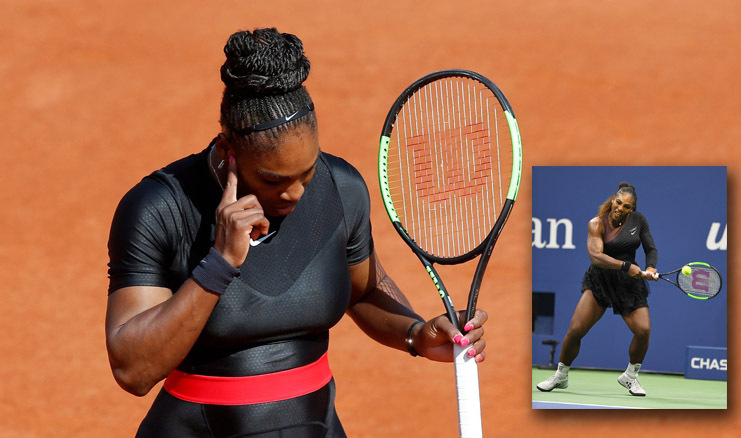 The full-bodied, skin-compressing outfit was designed to protect against blood clots after Williams revealed that doctors had found a hematoma in her body after she gave birth to her daughter Olympia. A hematoma is “a solid swelling of clotted blood within the tissue.” Williams suffered from a pulmonary embolism, which means the blood clots traveled to her lungs obstructing the blood flow to her lungs. “I almost died after giving birth to my daughter Olympia,” Williams explained. “First my C-section wound popped open due to the intense coughing I endured as a result of the embolism. I returned to surgery, where the doctors found a large hematoma, a swelling of clotted blood, in my abdomen. And then I returned to the operating room for a procedure that prevents clots from traveling to my lungs.” Without proper blood flow to her lung tissue, the tissue would begin to die. Without lungs to breathe, Williams would die. Why won’t they let Serena Williams be great? No matter how many drug tests, clothing bans, racially inflammatory slurs, and hatred is thrown her way…she always overcomes. Her greatness is undeniable. Just like that, on Monday, Serena overcame once more. She donned a creation by Virgil Abloh, the brand new black artistic director of Louis Vuitton’s men’s collection, in collaboration with Nike. Abloh designed a black one-shouldered bodice that was paired with a fluffy black tutu made of tulle. To pull it all together Serena wore fishnet tights which were cute and practical in terms of compression. It should be noted that at said U.S. Open on Monday, Williams defeated her first round opponent Magda Linette of Poland, 6-4, 6-0.